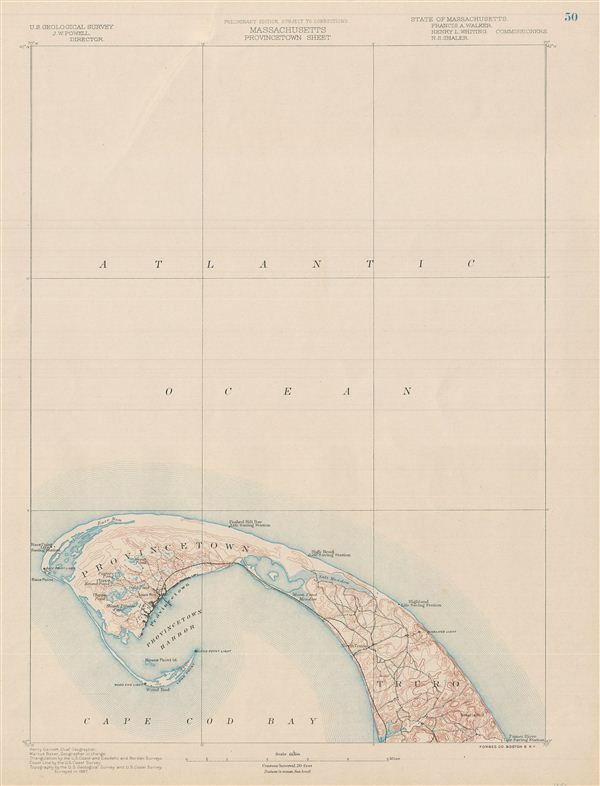 A fine first edition example of the 1887 U.S. Geological Survey's map Cape Cod, Massachusetts. Covers from Gull Pamet River and Smalls Hill north along the cape as far as Provincetown Harbor and Race Point. Offers typical superb detail throughout noting topographical features, rail lines, light houses, marsh lands, and numerous individual buildings. Notes the Pamet River Life Saving Stations, the Highland light and life saving station, the High Head Life Saving Station, the Peaked Hill Bar Life Saving Station, the Race Point Light and Life Saving Station, the Wood end Light, and the Long Point Light. Very good. Minor crease upper left quadrant. Blank on verso.